Home / Archive by category "Piano News"
We were recently fortunate enough to be able to provide a beautiful vintage Steinway & Sons Grand Piano to Sam & Kim Vallery of Little Rock, Arkansas. They were kind enough to send in a testimonial about the piano they purchased from us along with some beautiful photos, which we have included below. “What a delightful experience it was to come and see your pianos. We had scoured our area (Little Rock) in search of the perfect piano for me, but were left disappointed. We then hit the road. We ended up in Elkhart IN, visited several stores, and saved the best for last. Dennis gave me free rein to play whatever piano I wanted. No pressure, no time frame. 2019 is underway! 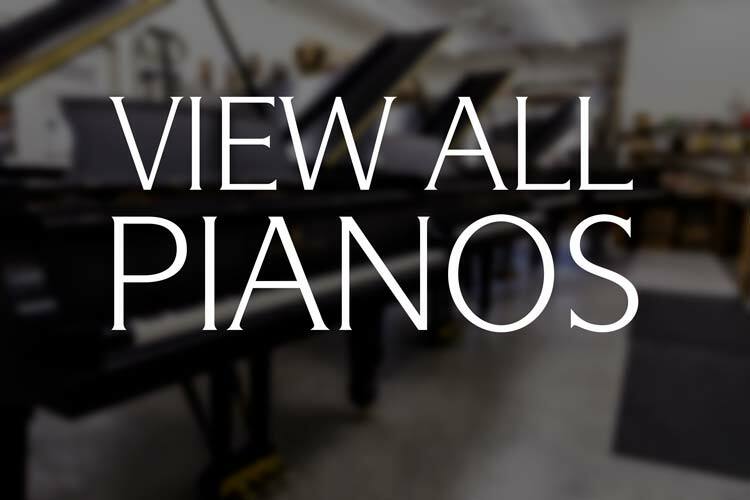 Whether your New Year’s resolution has anything to do with music or not, we just might have the piano that is right for you. 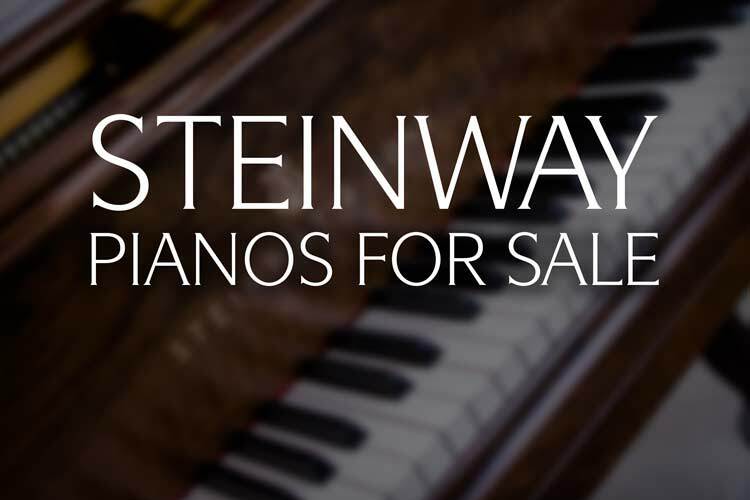 Along with our selection of rebuilt/restored grand pianos and new Kawai upright, grand and digital instruments, we also have a fine selection of pre-owned instruments at astounding prices. Here are just a few of them! This historic Baldwin Model M Baby Grand Piano was fully rebuilt by Chupp’s Piano Service. Built in 1938 at the Cincinnati Baldwin piano factory, this grand piano was a family heirloom of the Deputy family, the last residents of the historic Ruthmere Mansion in Elkhart, Indiana. (In fact, one of their family portraits at the museum shows the family sitting around this very piano.) The piano is believed to have been moved out of the mansion in 1969. Recently, the Deputy family generously donated the Baldwin piano to the Ruthmere Museum, returning it to its former home. This is the story of a historic piano’s full restoration. Producer/Shooter/Director: Benjamin Rogers – Music Written & Performed by Philip Balke – Special thanks to The Ruthmere Museum of Elkhart, IN. 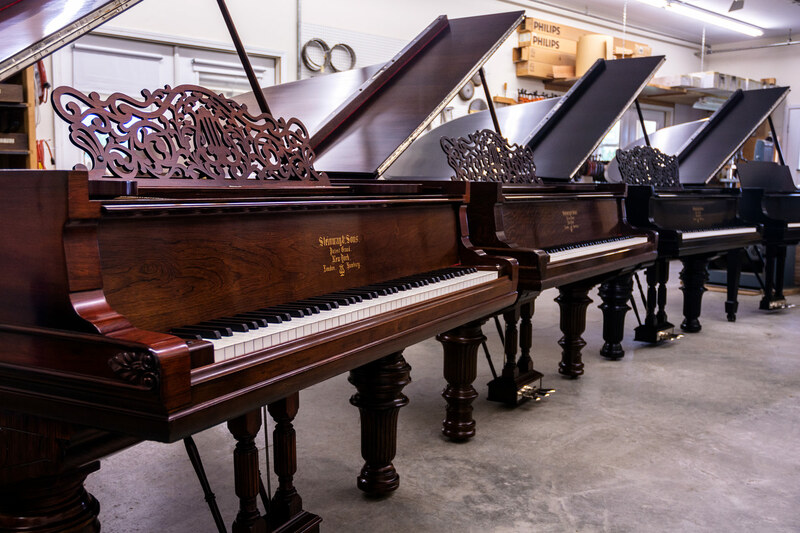 We recently had several pianos lined up in our Rebuilding Facility that spanned the near entirety of what is considered the golden age of Steinway & Sons Factory quality. When we saw what we had set up, we couldn’t help but snap some pictures to share! For lack of a better word, this was just plain cool! 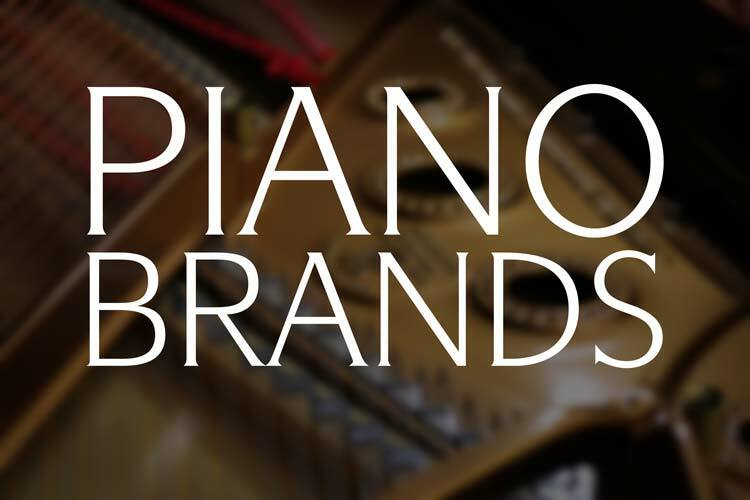 From the early days of modern piano building to the style of instrument most popular today, it’s all represented! Here is some detail regarding these fine grand pianos. Steinway & Sons Model D #52626 was completed in early 1885. This means that construction of this piano began at the New York Steinway Factory in 1884. This is the first year that Steinway ever made what is now known as the king of concert grand pianos, the Model D! Veneered in a rich cut of rare Brazilian Rosewood and as one of the very first Model D Concert Grands ever built by Steinway, this piano marks the beginning of an era. It is a rare find indeed! 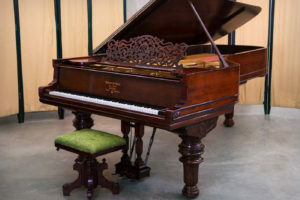 The piano features a then typical round arm art case design with double narrow moldings around the case, a figured music desk with ‘old-style’ fretwork, hand-carved Victorian fluted flowerpot legs with hidden casters and a large box pedal lyre with carved pillars. This instrument was originally purchased for use at the DuPage County Library near Chicago, IL. This concert grand piano is currently located at our New Paris Rebuilding Facility and is available for selection and purchase. Find The Piano For You in our Fall Selection! The new school year is in full swing and many are starting back into music lessons as well. Now is the perfect time to consider the purchase of that upright piano you have been thinking about! We have assembled a selection of high quality, used upright pianos that run the gambit of budgets and tastes. Sitting alongside our selection of new upright pianos, these used instruments are all in excellent condition and come with a Three Year Warranty and free local ground floor delivery! Chupp’s Piano Service of New Paris, Indiana recently had the pleasure of working with Lorraine S. of Central Indiana. She was kind enough to provide the following testimonial regarding the restored Mason & Hamlin Model AA Grand Piano she purchased and her experience working with us. I recently inquired about a used piano that I saw on Chupp’s Pianos website. Dennis promptly replied and invited me to visit the showroom. I mentioned that I would be traveling near their showroom over a holiday weekend so he and his son, Tim, were kind enough to open the store on the holiday to accommodate my schedule (now that is customer service!). Tim was extremely patient as I spent hours at the store deliberating between a few pianos and, after much deliberation, chose a rebuilt 1926 Mason & Hamlin. Tim also gave me a tour of the piano restoration workshop, which I really enjoyed. As a former piano major, piano teacher, and church musician, I had not owned a piano for over five years since moving into my new home. Buying a grand piano is a major investment, so I had plenty of trepidation as to the cost, new versus used, and the brand after having searched online over a period of time. Overzealous salespeople are a real distraction to me, so I liked that Tim did not pressure me into buying anything, but instead let me browse and discuss at my leisure. Chupp’s Piano Service of New Paris, Indiana recently had the pleasure of working with Timothy Clifford of Illinois. He was kind enough to provide the following testimonial regarding the Steinway & Sons Model L Grand Piano he purchased and his experience working with us. “Dennis was very knowledgeable and generous. He was able to find me an instrument that fit my needs and budget. No other dealer or private seller had anywhere near the same offer in terms of quality and price. I have a graduate degree in piano performance and so I am picky about what I want in a piano. Chupp’s provided me with an excellent option. This was the first time I shopped with Chupp’s but the third piano I’ve purchased. I doubt I will ever buy an instrument from anyone else ever again. Buying a piano can sometimes feel like buying a new car. Dealers can sometimes be dishonest and there’s always the feeling of settling. This was NOT the case while I was working with Dennis. Chupp’s Piano Service recently fully rebuilt two rare grand pianos for Carolyn Ripp, a pianist here in Indiana. The first piano we rebuilt for her was a stunning Steinway & Sons Model AR grand piano in an African Flame Mahogany cabinet. This piano was originally a player instrument, built around the legendary Steinway A-3 scale design. The second was a powerful Everett 9′ Concert Grand Piano. An incredibly rare instrument, this 9′ concert grand boasts an incredible quality of tone and touch. Built during the company’s early days in Boston, this is one of only a handful of these pianos still in existence. Carolyn was kind enough to send in the following letter of recommendation regarding our piano restoration work. I am seriously failing for words to describe the beauty of the two pianos you restored for me. The Steinway came first and its remarkable restoration was breathtaking. Then the unusual Everett came and we could hardly believe the volume of sound that it produces. Now I am enjoying picking the piano that will render the music at it’s finest. Every key plays perfectly, every sound is rich. Now that both are together again, I appreciate these instruments more than ever before. I always knew they were both special, but to play them now, it is just a decadent experience. Even my tuner said that when he presses a key to tune, that it is so beautiful, he feels like he is “playing” these pianos and enjoys every sound! It really shows how much your staff really appreciates and cares for the pianos that come their way. Every step of the process of achieving this remarkable result has only added to the whole, wonderful experience. BRAVO!! I have played many fine instruments of rare value, but I couldn’t want anything more. This IS the most exciting time of my life. Thank you! If you were staying at the St. Louis Union Station Hotel this past week, you may have seen a few pianos around. The 60th Annual PTG Convention & Technical Institute was held in St. Louis and Chupp’s Piano Service served as one of the ‘Key Sponsors’ and manned a booth in the exhibit hall. Dennis, Tim and Ben alternated between manning the booth and classes, while Philip attended a number of classes over the course of the convention. Kawai Musical Instruments president Hirotaka Kawai sat down with Frank Alyker of Music Inc. Magazine to discuss Kawai’s 90th anniversary and the growth and philosophy of the Kawai company. Founded by Koichi Kawai in 1927, Kawai has grown to become one of the leading piano makers in the world. Over the years they have also manufactured organs, synthesizers, and guitars. Through all of this, however, they have remained focused on their primary goal – the perfection of the piano. Chupp’s Piano Service is proud to be the authorized Kawai dealer for the Michiana region. Longtime professor of music Dr. Charles (Chuck) Clevenger gave his farewell piano recital at Cedarville University recently. Dr. Clevenger performed on a Steinway & Sons Model D Concert Grand that we fully rebuilt and provided to the university. He visited our shop last year along with other faculty and students from the university’s piano division last year when they were selecting several restored Steinway grand pianos from us. We wish him happiness in his well-deserved retirement! The January meeting of the local Piano Technician’s Guild was held at our rebuilding shop in New Paris, IN. Dennis taught a class on proper Dampp Chaser Piano Life Saver System installation and specific issues they may run into when installing them onto Steinway grand pianos. Other various piano tech related subjects were discussed amongst the group as well. We look forward to the next meeting! We recently provided Lois from Richmond, Indiana with a restored vintage Mason & Hamlin Model A Grand Piano. She was very happy with her newly restored instrument and was kind enough to send in the following letter of recommendation. NEW PARIS — Tucked away in a corner of Elkhart County, a special brand of vintage music is being made – well, actually remade. 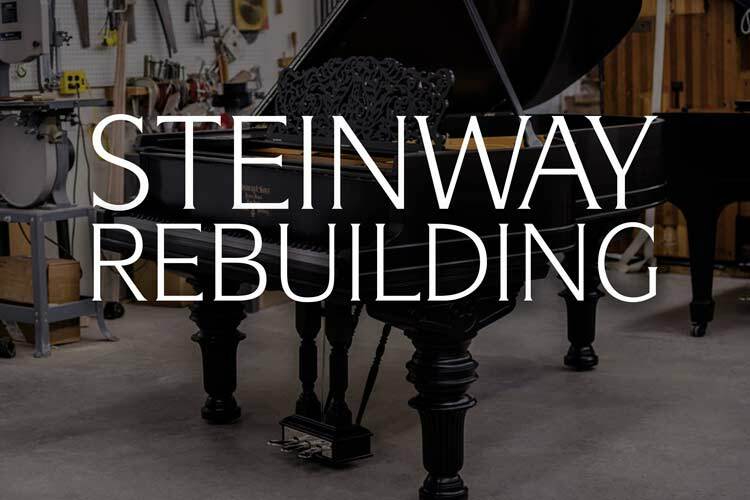 The restoration of famed Steinway & Sons pianos – the most famous name in pianos – has become the specialty of Chupp’s Piano Service, a New Paris business founded in 1975 by Dennis Chupp, a master piano technician. Chupp, who learned his trade of restoring and prepping Steinways, has sold more than 2,000 models. 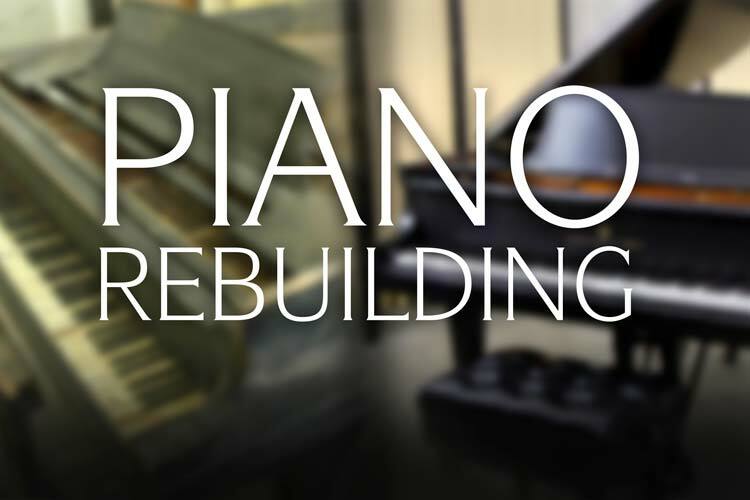 The business not only restores and repairs, they tune, locate, move and set up pianos. Recently we were happy to provide a Kawai GX-2 Blak Series Grand Piano to Deb and Rob in LaGrange, Indiana. We also installed a new QRS PNOmation3 Player Piano System on the instrument. They were kind enough to send in a testimonial about our service, which we have included below. “I am so very thankful for Chupp Pianos! When my house burned down, Tim got me a replacement estimate very promptly, so I could send it to the insurance company (at their request). And even though it was almost two years until I was moving into a new house, they remembered and took very good care of us, meeting us at their showroom twice and giving us a tour of their impressive rebuilding facility in New Paris. Over Four Decades of Piano Experience. New Kawai & Pre-Owned Yamaha. Error: Error validating access token: Session has expired on Thursday, 10-Jan-19 19:00:02 PST. The current time is Thursday, 25-Apr-19 00:05:19 PDT.